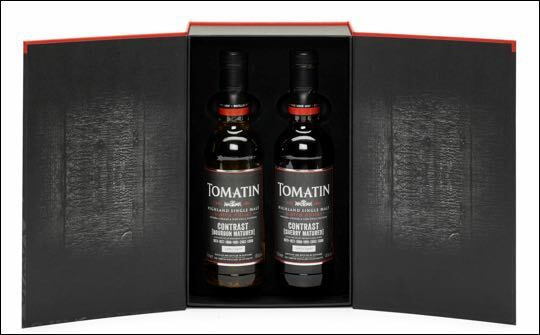 The Tomatin Distillery has released a limited edition pack of Tomatin Highland single malt Scotch whisky called Contrast – a comparison of fully matured bourbon and sherry whiskies. 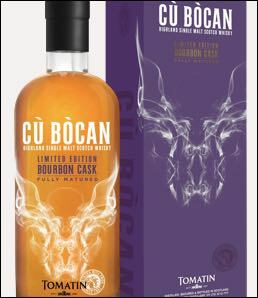 The company has also announced the final edition in its Cù Bòcan limited release trilogy. In each Contrast pack, there are two 350ml bottles each containing a vatting of casks from 1973, 1977, 1988, 1991, 2002 and 2006, with one of the vattings being from ex-bourbon casks and the other from ex-sherry casks. Bottled at 46%abv, both whiskies are non-chill filtered and natural colour, and display greatly contrasting colours and flavours. The Bourbon Edition is the third and final release in the trilogy of limited editions showcasing the flavours that make up the standard edition of Cù Bòcan – Sherry, Virgin Oak and Bourbon. The Sherry Edition was released in 2014 and the Virgin Oak Edition earlier this year. Fully matured in First Fill Bourbon casks, this edition is rich and creamy with hints of smoke and sweet citrus. There are 6,000 bottles available worldwide (except US) and it is expected to retail at £49.99.